So not your usual choice of recipe for February, but there is a reason for it. Blood oranges are in season. Blood oranges are slightly smaller than your everyday orange with beautifully pink coloured flesh, sometimes even a vibrant red – hence the name. The change in colour comes from the warm Mediterranean days followed by much cooler nights, which is why there are only available at this time of year. The change in temperature activates the Anthocyanin, a powerful anti-oxidant, which gives the red pigment. Blood oranges are deliciously sweet, with almost raspberry notes and make a wonderful desert just by themselves, with the skin and pith removed and cut into slices served with a dollop of crème fraiche. We have been using them in as many dishes as we can - juices, cakes, compotes, marmalades, salads and cocktails. A simple salad that we served recently to an Italian client was a salad of blood orange, fennel, rocket, hazelnut, and mint with a peppery olive oil. Another was with roasted baby beets and goats cheese. 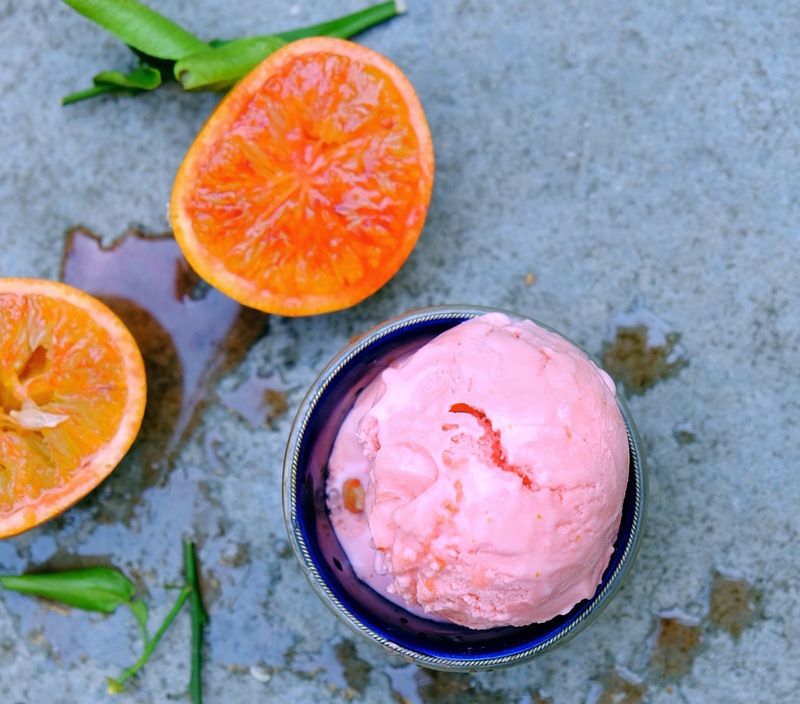 We had thought about making Blood orange sorbet knowing that the colour would be vibrant and fun to serve on a dreary February eve, but we decided to go for an ice cream instead, thinking it would work well with the creaminess, and it did. It is still beautiful, a bright baby pink that has a nice subtle citrus taste that cuts through the richness of the ice cream. Homemade ice cream is much easier to make than you might think, and is always an impressive way to finish a dinner party. The great part is you can make it way in advance, it will last for months in the freezer. It is super chic served by itself, if only to add a few segments of fresh blood orange, and perhaps some chopped pistachios.